Smith-Magenis Syndrome is a complex disability. Each individual will exhibit different aspects of the characteristics and so each family with develop their own ‘coping’ strategies. It is important to get professionals involved early on to provide the family with the support needed. Input from paediatricians, Speech and Language therapists, Physiotherapists, educational professionals, Portage, social services, Child and Adult mental health services etc are all very important and a multi- agency approach is vital! Our booklet provides a lot of practical helpful advice about coping with all aspects of SMS. It covers sleep, social relationships, behaviours, feeding difficulties, toilet training, dressing, school concerns, behaviour in adulthood, siblings and sources of further help. 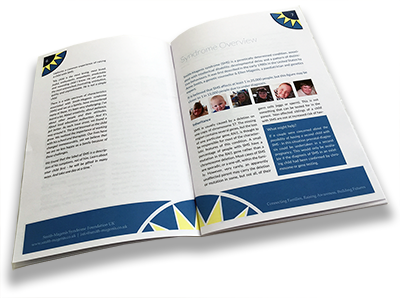 This booklet is available free from the foundation and each member will automatically receive one on joining the foundation. You can also download a free copy (pdf) , purchase a Kindle version at £1.49 through Amazon, or request a hard copy directly through the SMS Foundation using the form below. This booklet has now also been translated into German and can be downloaded using the link below. Many thanks to Dr. Alexander Ströher for the booklet translation. As children with SMS grow older many develop severe sleeping problems, this includes frequent waking and early rising. During the waking periods ( which can be quite lengthy) it is quite common for challenging behaviours to be exhibited. As a result of this it is important to try to minimise the impact of these periods of other family members. Many families have discussed sleep medication with their paediatrician or consultant – medication such as melatonin is widely used with varying effect. Some parents have stated the slow release melatonin is most effective. The use of black out blinds, to create total darkness. As with all children, it is important that clear routines and firm boundaries are put into place early on. Individuals with SMS can display very complex behaviours, they can display anxiety, agitated outbursts, aggression, self harming, obsessive behaviours. Support from professionals with delaing with these behaviours is very important and some families opt for behaviour medication ( again consultation with professionals is required). Keep schedules as predictable as possible- This does not mean keep everything the same all the time, but it has been found to be very beneficial to provide as much notice as possible of any changes. Praise of positive behaviour and as little notice as possible of difficult behaviour – whilst it is difficult to ignore unwanted behaviours, individuals with SMS thrive on adult attention, by receiving it when they are displaying difficult behaviours, but receiving a lot when displaying positive behaviours will hopefully become a useful behaviour management technique. Sometimes you will just need to leave your child to work though the outburst – ensure they are safe, if possible turn away so they understand that the behaviour is not acceptable. Remain calm and only intervene if necessary. Please refer to the booklet for further information.